Would not recommend what so ever, stayed here 15th until 27th of may this year and on 4 different occasions things went missing from our room, we went to the manager and explains and he said nothing could be done! Thank you for a brilliant stay at the Village Inn. Great food, great accommodation, very friendly staff. We have had a fantastic holiday and will be definitely going back. The apartments themselves were lovely, clean and tidy, the only problem been the showers. Now I have been to other greek islands before but don't ever remember the showers been quite like these, however having spoke to others I now understand that all the showers in Zante are the same. (I won't spoil it for those who haven't experienced the bloody things, but you'll see what I mean!) The only problem I have with the village Inn is those that own and run the place, they're the most unfriendlist people I met whilst in Zante, they're rude, and as for the feckin security guard that follows you to your room on a night, well what a TW*T!!! The food is SH*TE, apart from the club sandwiches, however I'm sure you can't live for two weeks on club sarnies! There is a place across the road called Hotel Yakinthos which we went for brekky every morning, which was BEAUTIFUL! The guy that works behind the bar on an evening @ HYakinthos is great, friendly, and if your single probably a sleeze!!! As for the walk into laganas, well what a joke, before we left I looked on the net, and someone said that it would take approx 20mins, you are having a laugh........more like 45mins!!!! Taxi's are ok 6 euro's each way. All in all great holiday, just a let down on the friendliness of staff @ VI and a bit a walk into town, but apart from that can't fault the place! Meet some great people, drank some orgasmic drinks, and went with 3 of the best people I know! Shame I'm back @ work!!!! 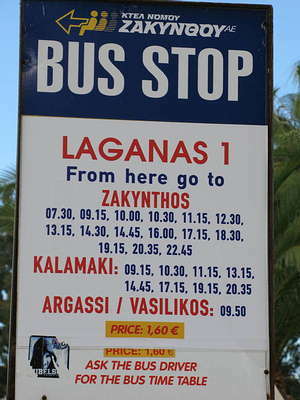 Was it easy getting a taxi into Laganas from here? Do you have any photos you could post on here? We stayed at the Village Inn last August. It is a nice property that has everything you need for a relaxing holiday like good food, nice drinks, big pool, friendly staff, spacious and clean apartments etc . I recommend this place to everybody. We are will visit again next summer. Just got back from the Village Inn. Had a great time, and I am definitely going back. The best thing about it is the location, because it was a quiet place where my wife and I could relax, but it was close enough to the center of Laganas for us to take a bus (which runs every hour or so) or a taxi. I recommend it to anyone that wants to have a really good time! Just got back from the village Inn.We booked to stay at the village apts because it advertised something going on everynight(B-B-Q, Karaoke,Arcades) which we thought would be ideal for a family with a teenage son and daughter of 15 & 12,but in the 2 weeks of are stay there was no such thing.There was 2 pool tables and a bar football table and cable TV.The pool area never got to over crowded (which suited) and we often had the pool to ourselves.It was an oppurtunity however to mix with Italians,Spanish and Greeks as the village inn is open to all European Countries and not just the British.Thats probably why the pool was quiet during the day.Recommend eating at Jimmys and hiring a motor boat from the beach. We have just got back from a week at the Village Inn, 3 adults, and 2 kids. We stayed in a two bedroom apartment, which in reality is 1 bedroom containing a double bed, and 3 single beds in the main room. 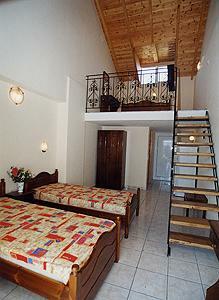 There is air conditioning in each room, and the private bedroom has its own balcony. 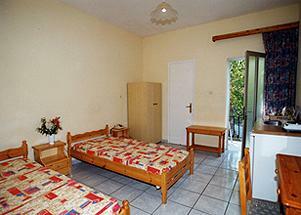 The apartment is very spacious and clean, and has a superb fill size fridge and freezer. The family which run the Village Inn are very friendly and helpful, and made us feel very welcome. The Pool is kept clean, with plenty of sunbeds, and is well used by the families which stay at the Village. The only slight drawback is the distance from Laganas center and the beach. It is 1.5 - 2 kilometres and takes around 20 minutes to walk. If you have young children, then try to avoid walking as there is very little by way of a footpath and most of the walk is on the main road. 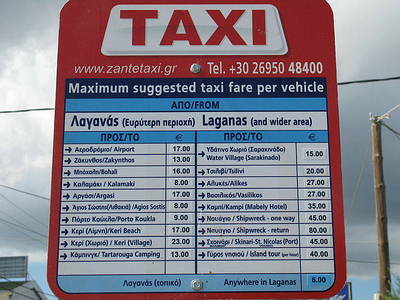 The taxi fare is 5 or 6 Euro each way to the centre. The taxi fare from the airport to the Village Inn cost us 9 euro. 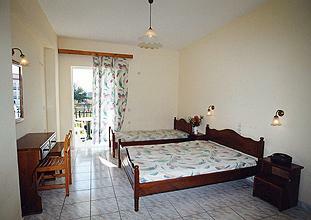 All in all the accommodation, by Greek standards, was excellent, and I would recommend the Village Inn. By booking our accomodation through their website, and our flights independantly via 'Instant Holidays' we saved approx �400 against the best price that a travel agent could get for the 5 of us. is a very well run family concern. All the staff are friendly and provide an axcellant service. The hotel is just far enough away from the main strip so you can still have the peace and quite, but only be a 5 min taxi ride away for only 5 euros. Zakynthos is awesome, and Laganas has the best clubs on the island...I stayed at Village Inn all last summer and had a blast. I met so many people (single people and also young families), and the family that owns the apartments was friendly and very helpful. Stella's breakfasts were really good. The apartments themselves were meticulously clean with cute balconies that overlooked all the action below. I definitely recommend this place!!!! Zante is my favorite Greek island. I went to the Village Inn last summer and had a great time. 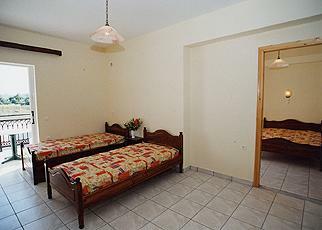 Nice and clean apartments, in a quiet location, big pool, nice bar and friendly atmosphere. I strongly recommend it to everyone. I am going back this summer! Zakynthos is one of my favorite Greek islands, and this is the BEST hotel to stay in on the island! The hotel itself is very kid-friendly (my kids love eating ice cream and playing in the swimming pool). The hotel itself is family-run and this is evident in the way that they pay personal attention to the guests. I would highly recommend visiting the website, which is easy to use, and if you click on RESERVATION, you can easily make your reservation right on it. Very nice apartments, clean and in a quiet location. Great food, good fun, nice family atmosphere. I strongly recommend the Village Inn to families and couples. Me and my friend stayed here for a week from the 5th sept. The room was really nice and very clean. The staff were really friendly couldnt make you feel more welcome! The dogs are cute aswell! Zante is fantastic this was my second time back this summer, deff go back again & would stay here again! Get a taxi into the centre as is is quite a long walk, only 5 mins in a taxi! Prob cu next year! Just back and although it is far out it couldn't have been nicer and the staff are really friendly. Would definately stay there again. Excellent!!! Second time we have been there and will be back next year. Food is first class! Didn't actually stay there, but met an Italian guy called Luigi who was about 25 from there around the 14th August 2002. Anyone know him? Get in touch! I think he was in room 21? Very nice location away from the noise. Provides nice facilities for adults and children. Has pool room, tv room showing all sports events and deferent movies each night. Big pool and a bar open almost twentyfour hour. Very nice family apts. Recommend it for all ages. just returned from Village Inn Appts. further than we expected from beach/town took us about 45mins. We had the end appt next to the dogs the owners did have a word with their neighbours but to no avail. We had Tatiana for our maid she was brill changed sheets 4 times and towels every other day always with a smile overall not bad for what we paid. THE location is 30 minutes from the beach walking on the KAMIKAZE ROAD. the rooms are basic with ROOM 101 A TOTAL DISGRACE!!!! GET ACCOMMODATION IN THE NEW PART ONLY. TRY PLAYING FIND A MAID IF YOU WISH ANY TOWELS OR BEDDING CHANGED. IF YOU LIKE THE SOUND OF A ROOSTER WAKING YOU UP FROM 6.00a.m. ONWARDS AND LOCALS SHOOTING IN THE FIELDS EVERY MORNING & EVENING WITH THEIR DOGS BARKING . YOU WILL BE AT HOME. WAS NOTHING PROTRAYED IN THE HOLIDAY BROCHURE. YUK! YUK! YUK!! Hi can anyone help? I was at the village inn apartments 2 years ago and wanted to go back in July 2002, unfortunately none of the travel agancies have any details about the apartments, does anyone know what tour operator they are registered with or does anyone know the phone number for the apartments. What travel agent did you use to go to the village inn apartments. Any help on this matter would be great. Thanks Lesley. 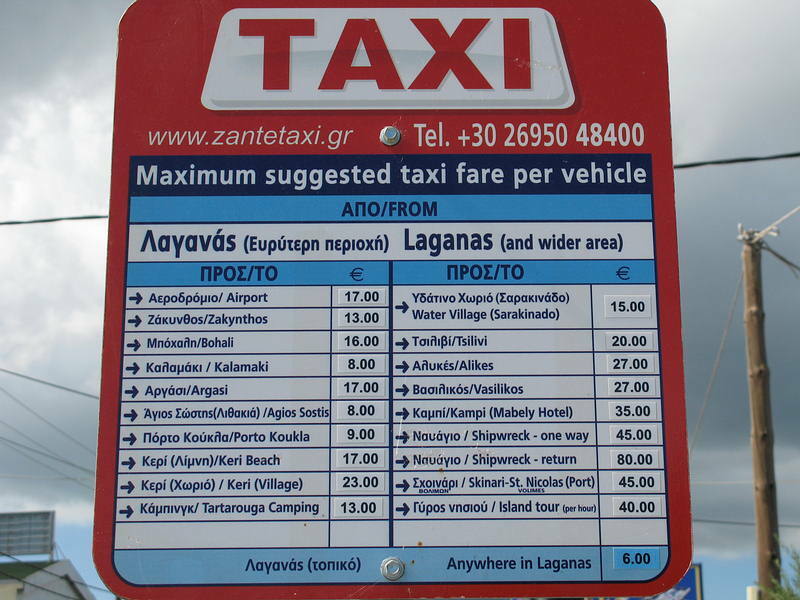 ZANTE IS FANTASTIC AND ID DEFINATLEY GO AGAIN....VILLAGE IN IS GREAT, THE STAFF ARE REALLY FRIENDLY AND THE NIGHT ENTERTAINMENTS GOOD....BUT DEFINATLY GET A TAXI INTO TOWN THE WALK TAKES FOREVER.